The new Duncan Aviation facility is a 70+ million-dollar investment that is a huge complex of hangars for business jet inspection, repair, modification, and painting. The complex which is still under construction will have 275,000 square feet of inside space when completed. The company currently has 135 employees and that number is expected to grow to 200 by the end of the year. The facility is located at the north end of the Provo Airport. Duncan Aviation obviously has a very positive outlook regarding the future of business aviation in the United States and worldwide. 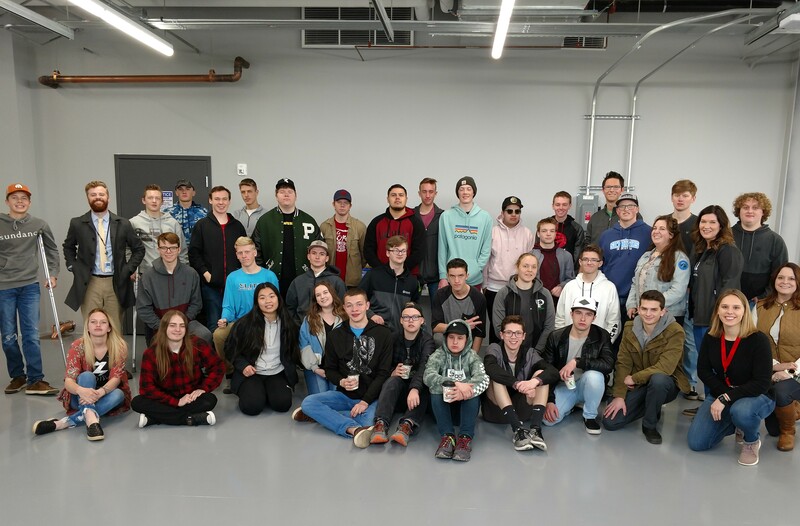 This was an opportunity for the students to see another option in aviation than the airline industry. The group of 40 students were divided into four groups to tour various areas of the Duncan complex. The main hangar area is huge and can accommodate up to 12 business jets depending on the size. A second identical hangar is under construction. Depending on the work required an airplane can be in the hangar 2 hours to 2 months. Turn around time is important because these are working airplanes in the world of corporate transportation. The parts room inventory is just shy of a million dollars. Additionally, the parts room ships and receive about 50 packages a day. The two huge paint hangars are still under construction and when completed will be the first “Green” paint facility in a private Maintenance Repair Center in the world. This paint hangar will put out cleaner air than we breathe right now. As an interesting side note, it takes 60 to 80 gallons of paint to paint a large airplane. The students toured the fuel farm where technicians explained how fueling was handled. Upstairs in the main hangar, the students saw the tire shop. Battery test shop, and the Non-Destructive Testing Laboratory which is still under construction. The 2-hour tour concluded back at the temporary lobby with some comments from Human Resource Specialist for Duncan Aviation Provo, Mina Perry before departing on the school bus. It was quite an amazing experience for the students to experience. Thank you to Mr. Halls for arranging this and for Duncan Aviation for allowing us to come.